The major consists of a host of modules. You “cross off” modules as your studies advance by taking courses which fit the module requirements. For some modules, there is only one corresponding course. These tend to be the basic modules and the respective courses are also obligatory for all EES students. Then there are the advanced modules. In order to meet the requirements for these modules, you can choose from a variety of courses and start shaping the major according to your personal interests. Module descriptions are particularly helpful when you want to check whether external classes (either at the University of Freiburg or at your host university abroad) would match the EES module requirements at UCF. 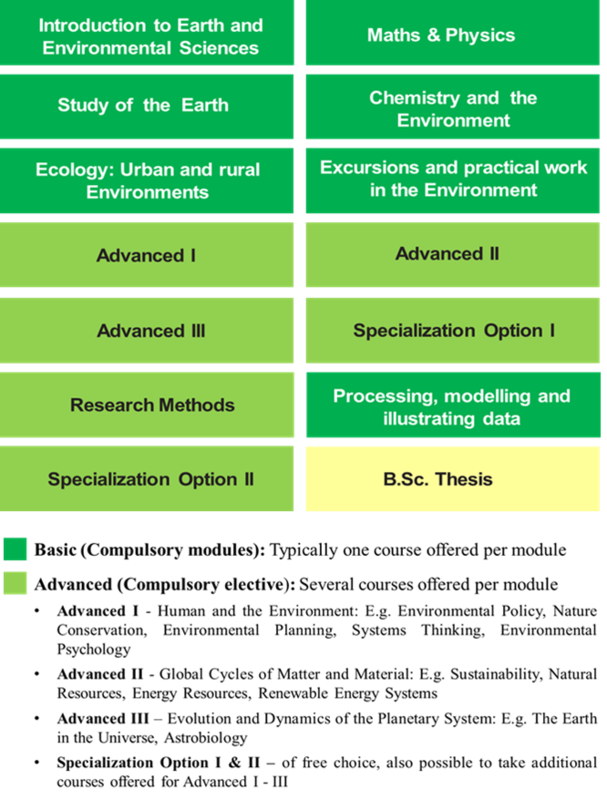 The following chart gives an overview of the content of all the basic and advanced modules in the Earth and Environmental Sciences Major (Stupo 2015). The most recent, detailed module descriptions can be found online.